Mosaics 'n More is a blog that will feature different types of crafts that will interest everyone. I really like when my different hobbies can feed off of each other and here is an example of one of those times. I like succulent plants and growing them. Sometimes I don't have a lot of luck, but I am learning. Recently I came across a project that could include my plant growing hobby with my polymer clay hobby. 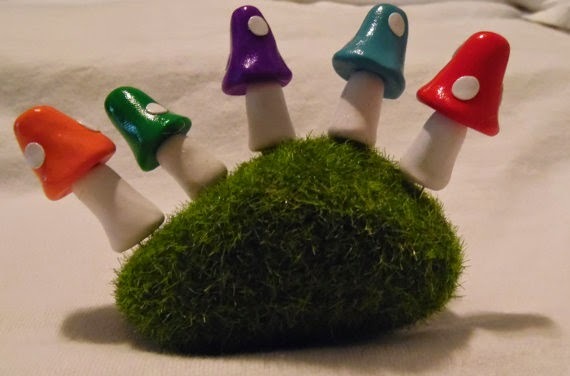 Fairy gardens are just down right cute and all of the pieces in a fairy garden can be made out of polymer clay. So I have started with the basic fairy door. It is about half done. All I have to do is add some embellishments like flowers and vines. I watched this video for some tips and it really made it look simple. I hope it gives you some help or ideas as well. This is the fairy door that I am making. The fairy door is still in progress, hope to finish it soon. It is the middle of August and time to start thinking ahead to the upcoming Holidays. 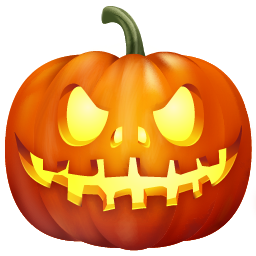 Since Halloween is the closest, I want to show you a great way to make a pumpkin. The artist is PauAdell and she is fantastic. I like the way she uses everyday stuff to make the pumpkin hollow. I will have to remember this for other projects as well! I hope you enjoy this tutorial. There will be more to come. Mosaics 'n More Is Back! After a very long absence from this blog I am back! Yay me!!! I haven't stopped crafting that is for sure, but I have been concentrating on two crafts lately. The first is mold making. I make molds for use with polymer clay, wax, soap, chocolate, fondant, just about anything you need a mold for I can make. I have a store on Etsy called The Mold Shoppe. You can use this link or the one located on the side under Featured Artists. I enjoy making these molds and glad that they can be used to help others make things easier and save them some time. This mold making also has led me to start making things out of polymer clay. Polymer clay is so versatile and you can make just about anything you want our of it. I am learning more about polymer clay everyday and will be sharing more about my polymer clay projects right here! So come back to see my current projects and maybe even some tutorials. So please make the Mosaics 'n More blog a routine visit during your browsing time. Thanks for stopping by! Here are some more ideas for using recycled glass bottles. The sources for these bottles are endless. You can use ones that you have emptied yourself, from your local bars or restaurants and of course friends and neighbors. So have fun collecting these bottles and making great art out of them! I am a big fan of glass. All kinds, clear, colored, textured, whatever it is, it is a beautiful medium to work with and I have always gotten great results for mosaics, glass totems, bottle lights and the like. If the glass is recycled, that is even better! Well, thanks to my Grandma, I have received one of her used kilns from her ceramic shop as she has now closed it down. This gift has expanded my options for using recycled glass. I can now "melt" glass bottles into dishes and trays among others things. I am still experimenting with the kiln to perfect the melting process, but the ideas are a plenty out there for projects to do. Below is a video that has given me much inspiration for a lot of future projects. Hope you enjoy it! Thanks to Bryan Northup for the great ideas! I am always looking for new and interesting projects to do. Recently I came across what was called Glass Totems at a local consignment shop. These Glass Totems or Garden Glass Art are basically clear and colored glass vases, bowls and plates stacked to make a beautiful piece of art to sit in your flower garden. After closer inspection of the pieces, I knew this would be an easy and awesome project to do. After collecting some pieces for The Sale Barn, Goodwill and yard sales I was ready to make my first piece. A larger heaver piece was used for the base to give it the totem some stability, then the rest was stacked up. I chose red as the accent pieces between some clear and clear frosted plates and a red Avon Cardinal was used as a topper. After doing a test stack, I glued the glass together using some clear, waterproof silicone sealant. It took 6 hours for the silicone to set and a full 24 hours till it was fully cured. At this point I could pick the whole unit at the base and it was structurally sound. I was also pleasantly surprised that it was not really that heavy! After some time out in the elements I was very pleased with the beauty and confident that it would not fall apart. This is a very simple and cheap project that you can do. You can have many pieces going at the same time with a healthy supply of glass. The silicone was most of the cost of the project, but the total cost was below $4.00! The totems that I had seen were selling for around $25 - $30, so a good profit for you crafters out there! I hope you enjoy this project and would like to hear how making them worked out for you! Good Luck!!! Here is a quick video to show you how to put grout on your mosaic! I hope this may clear up any problems you may be having!